The earthquake hit just as Anchorage was beginning its day, causing widespread damage, derailing plans and snarling traffic. 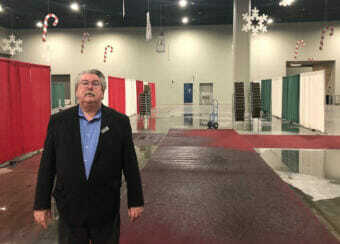 At the Dena’ina Convention Center in downtown Anchorage, water was steadily dripping from the ceiling. Greg Spears, general manager for Anchorage Convention Centers, said it was from the sprinkler system as he walked around to assess the damage, stepping around large puddles and pointing out fire retardant on the floors. Spears said in all his decades living here, Friday’s earthquake was one of the biggest he had ever experienced. At first, state officials told people in Anchorage to go to the Dena’ina Center if they needed shelter. Anna Oxereok was there with her sister and her eight-year-old grandson. They are from Wales in Western Alaska, but came to Anchorage for a conference. Oxerok said they were in a coffee shop with the earthquake hit. “Heard the rumble before we felt anything,” Oxerok said. Oxereok said she told her family members to get under the table. 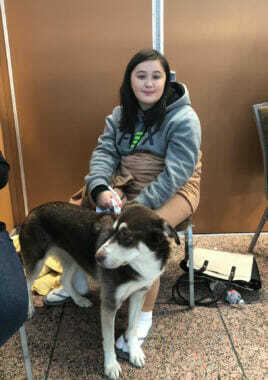 Soon, because of the damage to the Dena’ina Center, people needing shelter were directed to a different convention center, the Egan Center, a few blocks away. Many there were also from out of town, temporarily evacuated from their hotel rooms. Angela Johnson from Nelson Lagoon was holding her dog, Mavis, with a makeshift leash made of bathrobe ties. She said she was just waking up in her hotel room at the Hilton when the shaking started. Johnson was staying on the 14th floor. Wrapped in a blanket and wearing borrowed flip-flops, she was waiting at the convention center to hear from the Hilton when she could go back. Outside, a few windows were shattered and several traffic lights were out, but otherwise things were surprisingly quiet downtown. Most businesses were dark, having shut down for the day. Mike Middleton was standing outside Flattop Pizza and Humpy’s, two of the restaurants he manages. He said was dealing with water damage, a power outage and other, less urgent problems. “We lost quite a lot of alcohol and things fell, obviously,” Middleton said. “Hopefully by mid-afternoon, we might be able to open in some fashion,” Middleton said, laughing. As the rest of Anchorage got busy picking up the pieces from the 7.0 quake, Flattop did, indeed, re-open by Friday afternoon.